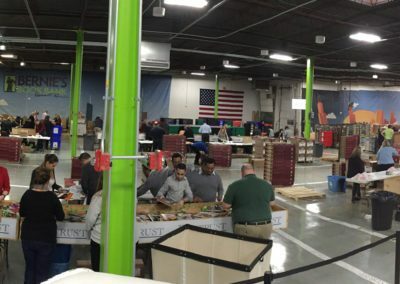 Bernie’s Book Bank is the perfect venue for corporate team building sessions, ‘Giving Back’ days, offsite meetings, strategic planning, and more! Nearly all successful businesses today recognize the importance of embracing corporate social responsibility causes. The right nonprofit partner can help a business boost its brand image, enhance employee engagement and satisfaction, create positive press in the media, and provide meaningful stories to share with customers and shareholders in company newsletters, websites and annual reports. 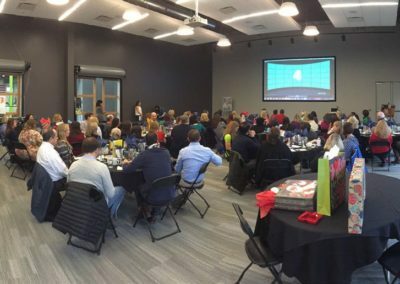 Why choose Bernie’s Book Bank for your next team building event? Everyone loves books and can relate to our mission of providing books to children. Sorting, stickering and bagging books is easy and not physically taxing or messy. The work is fun and allows plenty of time for socializing or networking. We can accommodate groups up to 125 people for a volunteer session. Bernie’s Book Bank will provide photos for your newsletters and annual reports. Pair a volunteer session with a book drive or internal initiative. Volunteering as part of an all-day meeting hosted at Bernie’s Book Bank or enjoy lunch before or after your session. Learn more.